Biodiversity (short for Biological Diversity) is the scientific term for the variety of life. It embraces all the plants, animals, fungi, single celled creatures and bacteria. It also includes the genetic variation within species on which survival and evolution depend, and even the great number of varieties and cultivars of plants and domestic animals that humans have selected for food and pleasure. We often worry about global biodiversity, which is the whole panoply of life on Earth, living within the astonishing range of habitats on our planet. More often however, we refer to biodiversity of a habitat, region or area of land or sea. For a general introduction to biodiversity you can look here. Biodiversity has grown and adapted through evolution over hundreds of millions of years, despite mass extinctions, major climate variation and changing patterns of continents. It is now considered globally threatened by human activities. We are destroying habitats, usurping much of the primary food production on earth, changing climate and changing global chemistry. Biodiversity loss is seen as a major threat to ecosystems of the world, including those that support human life. Measuring biodiversity is rather complicated and contentious, since it would ideally be the measurement of all the species and genetic diversity within the area of study. It would take literally generations of scientists to assess this for even an average habitat In practice we usually quantify biodiversity as species-richness, or the number of species living in an area, habitat or climatic zone. Ecological diversity is a bit different, and it brings in concepts of relative population abundance, so habitats with the same number of species, but where a couple of species are hugely dominant, are less ecologically diverse than ones with more evenly spread population numbers. This latter approach hasn’t been applied extensively in gardens yet, but could be interesting, because generally, if a garden species like brambles or nettles threatens to take over, most gardeners will cut it right back, giving space for a greater variety of other species. Gardens vary enormously in size, character and level of planting, but it comes as a surprise to many people that on average they are remarkably biodiverse, with literally hundreds and thousands of species, mostly small invertebrates like insects and spiders. Their biodiversity has only recently been recognised, but we are beginning to appreciate that in a changing and degrading countryside, gardens are likely to become more and more important as habitats and places for us to be able to enjoy wildlife. The two major reasons for the founding of the Wildlife Gardening Forum are the benefits for people in a thriving wildlife filled environment, and the biodiversity importance of them as habitats, especially in a highly populated country like the UK. We go into much more detail on garden biodiversity in three web pages, with associated additional information. The first addresses the fundamental question - How many species live in gardens - and why are they so very rich? The second page tackles a key issue for ecologists and gardeners. British gardeners mostly plant horticultural plants, most of which have been brought in from other countries, and often other continents. These plants are not native to the British Isles, and so for many years it has been assumed that these non-native plants are of negligible value to wildlife, even though we now know that typical gardens are actually full of wildlife. 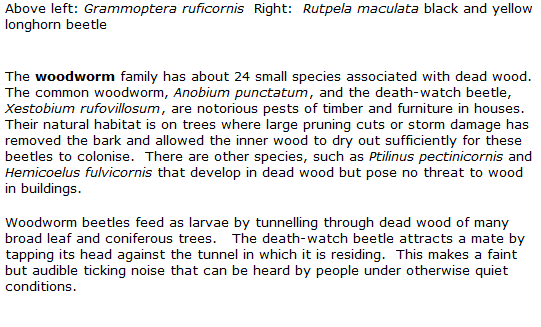 Our page Native and non-native species (with associated leaflets to download) goes into the evidence in some detail. The third page deals with an important question, which is still difficult to answer. How important are gardens for conservation of biodiversity? In general, gardens are not good at supporting species that are rare because they can only survive in very special and scarce habitats like bogs or saltmarshes. For the many species with more general tastes, the variety of mini-habitats that gardens can offer is remarkable, and gardens are important places for some species of conservation concern, like frogs and stag beetles. There is even evidence that some organisms are adapting and evolving to make full use of the garden environment. 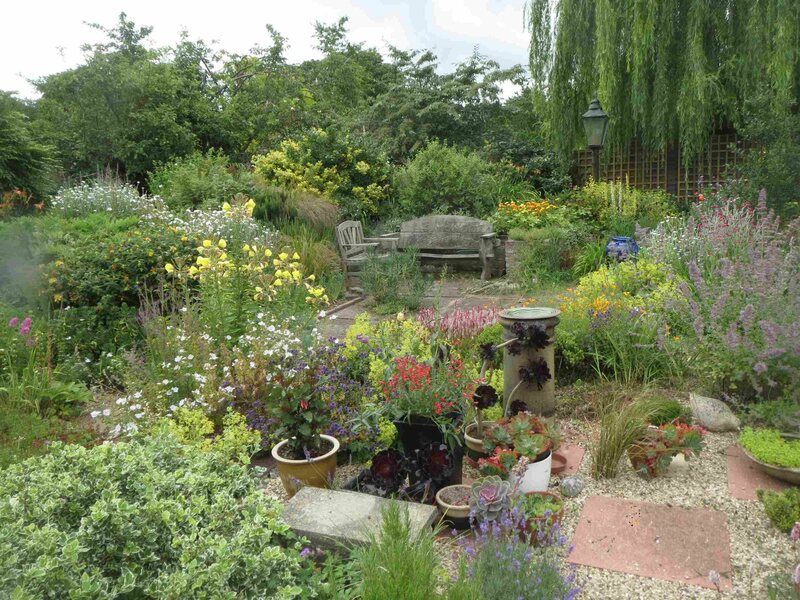 This superb Oxfordshire garden is a joy for its owners and visitors, but is also a very good habitat for wildlife. It contains plants of many different species, flower types and seasons, as well as a great deal of physical structure and different substrates. places for us to be able to enjoy wildlife. species (with associated leaflets to download) goes into the evidence in some detail. The third page deals with an important question, which is still difficult to answer. How important are gardens for conservation of biodiversity? In general, gardens are not good at supporting species that are rare because they can only survive in very special and scarce habitats like bogs or saltmarshes. For the many species with more general tastes, the variety of mini-habitats that gardens can offer is remarkable, and gardens are important places for some species of conservation concern, like frogs and stag beetles. There is even evidence that some organisms are adapting and evolving to make full use of the garden environment. This superb Oxfordshire garden is a joy for its owners and visitors, but is also a very good habitat for wildlife. It contains plants of many different species, flower types and seasons, as well as a great deal of physical structure and different substrates. Biodiversity (short for Biological Diversity) is the scientific term for the variety of life. It embraces all the plants, animals, fungi, single celled creatures and bacteria. It also includes the genetic variation within species on which survival and evolution depend, and even the great number of varieties and cultivars of plants and domestic animals that humans have selected for food and pleasure. We often worry about global biodiversity, which is the whole panoply of life on Earth, living within the astonishing range of habitats on our planet. More often however, we refer to biodiversity of a habitat, region or area of land or sea. For a general introduction to biodiversity you can look here.